NOTE: This content is old - Published: Thursday, Dec 12th, 2013. Councillors have voted to recommend the closure and demolition of Plas Madoc and Waterworld leisure centres, with a possible replacement facility if and when finance is secure. 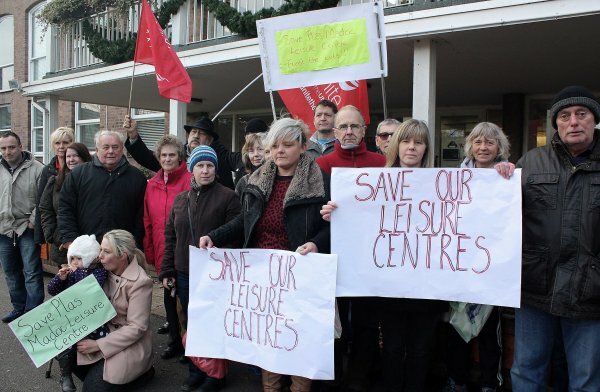 As with many of the recent meetings that surround the proposed cuts to local services, the public gallery was full of protestors and members of the public who had come to support their local leisure centre. Prior to the start of the meeting a protest was also gathered outside the Guildhall. It was revealed in the meeting that the 11 leisure centres in Wrexham cost £1.8million a year to run. While the primary focus of the meeting was on the future of Waterworld and Plas Madoc, it must also be noted that all leisure facilities in the area have were looked at during the process. Councillor David Griffiths told the meeting that: “No decision have been made, and today is part of the consultation process. The aim today is present the findings of the leisure review by the Sports Consultancy.” Much of the content in the report was highlighted in our preview report that we broke over the weekend. The meeting began with a small presentation / slideshow from two directors from the Sports Consultancy. The presentation covered a breadth of topics that related to their recommendations for leisure centres in Wrexham. Interestingly it was noted that a ‘visual survey’ had taken place, with no detail of anything further or more in depth. The consultants told the meeting they had looked at 16 different options, which we have not been able to find in the public domain. Details were given of a replacement Waterworld, with the meeting told the new facility in the town centre could have a 8 lane 20m ‘county standard’ pool, a learner pool, spectator seating plus a leisure water area. Pricing details were passed to the meeting, with information that the Council subsidise £2.50 per head of Plas Madoc use. 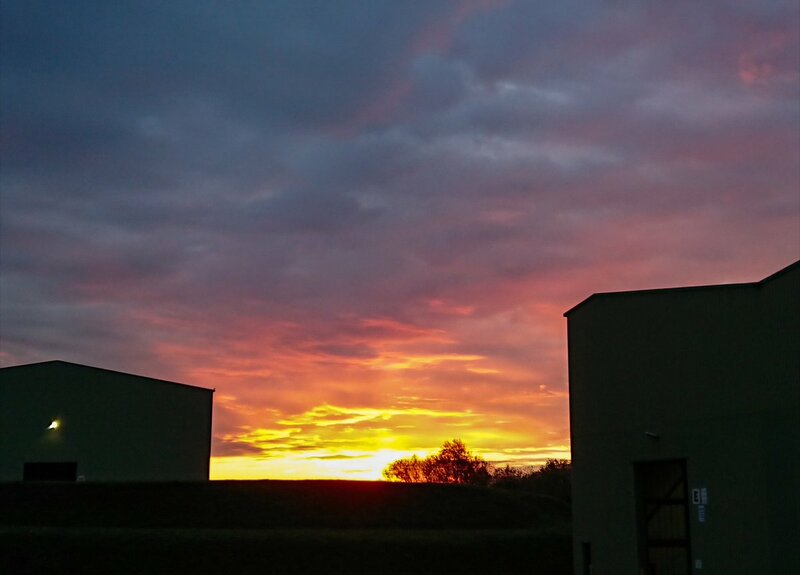 The consultants said “Waterworlds performance is better than the others, but constrained by physical constraints of the building, the gym is main revenue generator.” They also commented on the usage of the two leisure centres, with Waterworld accounting for 35% and Plas Madoc having 25% usage. A request had been made by a member of the public, Daryl Wright, to address the meeting. He said of possible issues getting to a replacement Waterworld “Do you think people who use Plas Madoc, a low income area, will get on a bus, where services are being withdrawn? Mr Wright also commented on a recent visit of his to Plas Madoc, where he saw a ‘steady stream’ of people coming into the centre to use the facilities. Speaking about the comments made by Mr Wright, Cllr Griffiths said: “I want to hear the real stories. It’s the same with a steady stream of people using it, this doesn’t seem to be coming out in the consultation. You do get people in the evening, but it means keeping it in the daytime for people to use it. Comment was also made on the usage figures given by the consultant, with Mr Wright saying he ‘felt like someone needs to shake the management to put on events and get people in there to do stuff’ and ‘no one at the leisure centre seems to have the initiative to pull people in’. Mr Wright received a round of applause from the public gallery. In what turned into quite a heated few minutes, was challenged by a second public speaker about his role and was asked about use of consultants. Mr Griffiths said he was happy to ‘take it on the chin’ and went on to say he was happy to be ‘interrogated’. There were calls from some councillors to stop the ‘interrogation’, and at this point one member of the public shouted ‘we spend millions on consultants, its shocking, shocking’ and ‘get rid of the consultants’. At this point there was consideration to stop the meeting, but it proceeded. A spokesperson from AVOW told the meeting how there are not many places in the UK where you can visit a beautiful heritage site, have a swim in a top class place and then shop in a top notch shopping centre. She also commented on the facilities that are available at Plas Madoc for those with disabilities. Cllr Griffiths further welcomed any ideas to raise the money and keep the facilities open, which had another public gallery contribution of ‘get rid of the consultants’. Officers were challenged to give details of the costs of the consultants, however as this is a ‘Part 2’ detail, aka secret, it was not possible to tell the meeting at that point. Councillor Paul Blackwell said of Plas Madoc plans that: “It seems with the cuts taking place that everything is focused on the town centre, if you live outside the town centre people will be stuffed. The Consultants told the meeting they had looked at four different options at Plas Madoc, first to keep the current pool only which would cost somewhere in the ragion of £2m and would still run at a revenue loss every year. The second option was to retain the pool and replace the sporthalls element, which would be a revenue loss of £15,000 a year. The third option was to build a wet and dry leisure centre costing £7m plus a revenue loss each year. Thus the only affordable solution to them was the closure of Plas Madoc and replacing Waterworld. The meeting was told of Plas Madoc that the main problems with wave machine is it stopped working at Easter, and it took three days to get going and they are ‘not overly confident we can keep it going’. The report considered today, including the slides from the consultants, can be found here on the Council’s website. (vi) it authorises the Head of Community Wellbeing and Development in consultation with the Head of Assets and Economic Development and Head of Finance, to consider options for funding the replacement facility for Waterworld (if Members decide not to invest immediately in a replacement facility), reporting back to this Scrutiny Committee at a future date. The ‘output’ of todays long meeting and debate was the altering of the brackets in the final point above. It is worth noting that todays meeting was not a decision making committee, however puts forward these recommendations to the Executive Board in January. Despite a vote taking place councillors were still asking questions after the vote and at one point it did appear to verge on what can only be described as a shambles. 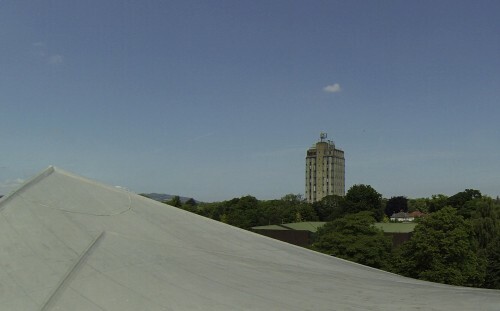 Picture: A defining view of the Wrexham skyline, with both the police station and now Waterworld set to be removed.